orion - Bills Bikes Toy Run for Palm Beach Kids & Toys For Tots! . . . A biker Fundraiser! 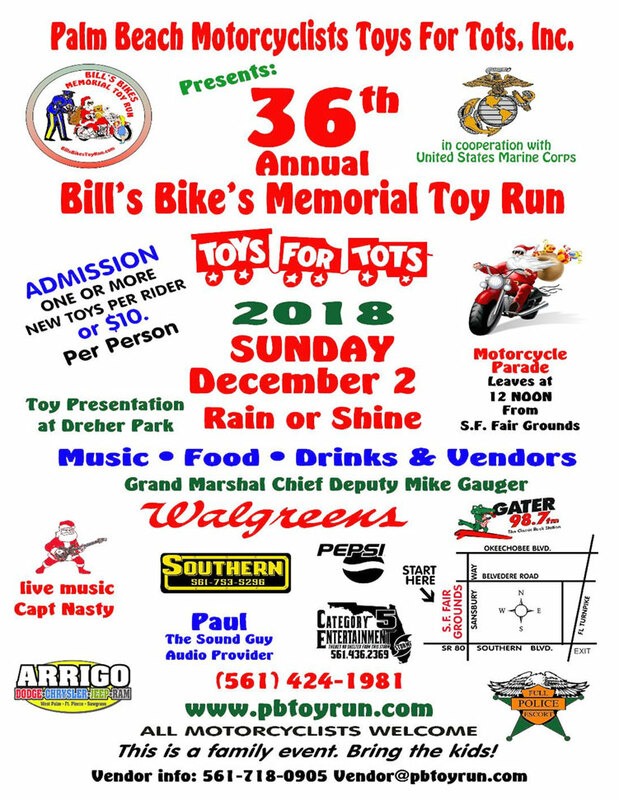 Palm Beach County Motorcyclists Toys For Tots, Inc. Celebrating our 37th year of fundraising! 36th Annual Toy Run event! 10AM: Bikers stage at South Florida Fairgrounds! Noon: Police escorted parade to park! 12 - 5pm Thousands of attendees enjoy a day at the park for the kids! Food, beer & beverages available! Local bands volunteer to entertain you all afternoon! Buy raffle tickets, great prizes! Event Tshirts & other event related(or not) products available! Lots of other great happenings, list to long to mention! You do not have to ride a motorcycle to attend. This event is open to the general public. All are welcome! Come to Dreher Park, High Noon! Bring the kids! Have a great time! Proud sponsor and drop location!